How do you cultivate Mennonite spirituality? 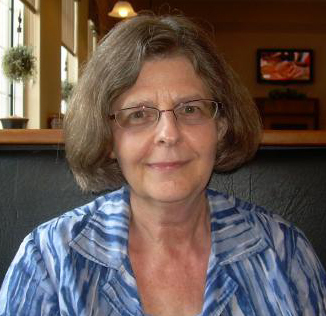 Dawn Ruth Nelson is the author of the book A Mennonite Woman: Exploring Spiritual Life and Identity. Photo by Beth Yoder. What is the spiritual commitment that is at the core of our identity as an Anabaptist community and followers of Jesus, who “for the sake of the joy set before him, endured the cross”? For me, figuring that out far from home, in the middle of the violence of Dublin, Ireland in the 1980s meant integrating other Christian traditions with the practices of my plain grandmother. All these practices – together – have nurtured my life as I try to live out discipleship, peacemaking, and witness. I think other Mennonites in urban and mobile settings are trying to figure this out, too. I’ve received requests from churches in Toronto, Champaign-Urbana, Evanston, and Montreal to come and talk about spiritual practices, commitment, and depth. They want to talk about how to cultivate a Mennonite spirituality that makes sense in today’s world. (And also, interestingly enough, requests came from Franklin Conference, in central Pennsylvania. Even in our more rural heartlands we are asking the question: How can we be more aware of and intentional about our spiritual practices?). To be conformed to Christ, to be formed by Christ, we need to spend very significant time with his words and in his presence, corporately and privately. I am convinced of the centrality of Jesus and of the encounter with the Risen Christ through the Scriptures as a way to anchor Mennonites (and all Christians) in [what could be called a] Dark Night transitional time. Nelson Kraybill, at the time president of Associated Mennonite Biblical Seminary (AMBS), said the “church . . . must be centered on Jesus. . . . Transforming ministry requires sustained encounter with God made known in Jesus Christ. . . . When the risen Lord is the center of our lives, the Spirit will empower us to speak and act in ways that honor the One who shows us the face of God.” The centrality of Jesus Christ is not an unfamiliar theme to Mennonite-Anabaptists, who grew out of medieval movements practicing the imitation of Christ (imitatio Christi). “Finding a centering rather than a fracturing experience” is how one AMBS seminary student described what happened as he worked on spiritual formation in the 1980s at AMBS. Finding a centering experience is key. That is what [spiritual] disciplines and contemplative prayer do for us. Some people find themselves in a tremendous balancing act, juggling their lives, family and profession. They need something to hold everything together—a deep anchoring in Christ. Centering or contemplative prayer allow us to center in on our experience with God, become anchored in Jesus, as a way to give some coherence to an increasingly fractured existence. 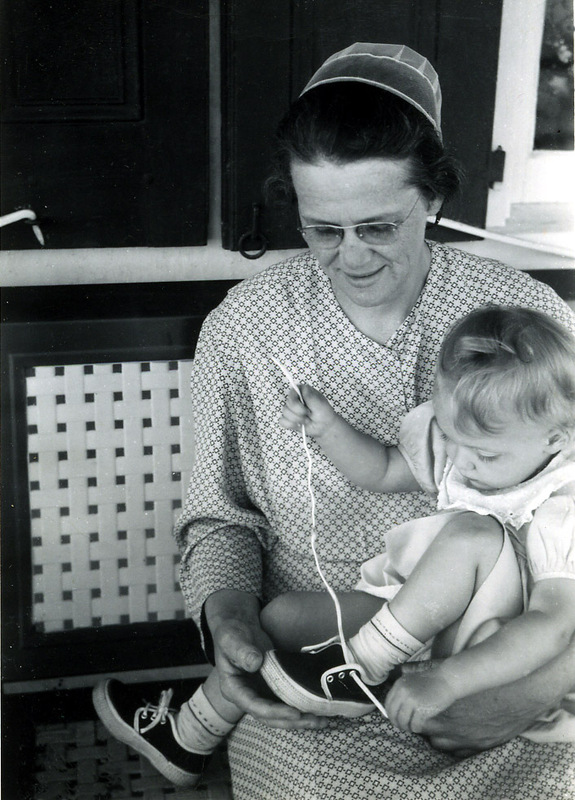 Dawn with her grandmother in 1954. Photo by John Ruth. In my grandmother’s life, this coherence was provided by an ordered life that centered around a particular place that never changed for her. The place we meet God now is often “in Jesus” through the contemplative disciplines. Some Mennonites are using these now as spiritual formation tools—silence, solitude, daily personal prayer time, spiritual direction, contemplative/listening prayer, lectio divina. One suggestion: Teach people in Sunday school how to practice listening prayer and lectio divina. Also offer special weeks of prayer where people commit to reading a Scripture daily, meeting daily for half-an-hour with a spiritual director, and meeting with a group for faith-sharing at the end of the week. Take Sunday school classes on weekend retreats following the suggested retreat outlines in the book Soul Care: How to Plan and Guide Inspirational Retreats. We need a concerted congregational effort to help people learn to pray, to listen to and talk to God, to read Scripture in a listening mode (lectio divina), to ask, What is God saying to me today through this Scripture? And we need to accompany them as spiritual friends or in spiritual direction as they try to pray. –Reflections on and from A Mennonite Woman: Exploring Spiritual Life and Identity by Dawn Ruth Nelson, available from Cascadia, Amazon, or on Kindle. E-mail Dawn.